Written on April 30, 2008 by Kevin. We headed up to California on Saturday morning and I wanted to make a special trip again to the Cabazon dinosaurs. Every other time we have headed up there, the sun has been setting and pictures are just too difficult to take but this time we had the sun placed perfectly and ready for some good shots. I like to stop by the dinosaurs each time so that we can watch the kids get bigger with each new set of pictures. The dinosaurs are neat to look at as well. We learned a bit of good news about the dinosaurs. There will in fact be many more. They are currently building additional dinosaurs behind the 2 large ones that are easily seen from the highway. These new dinosaurs are much much smaller but much more detailed. The area is fenced off currently so it is unknown exactly what they are planning. One thing that confused both my wife and I was that they stuck a medieval knight fighting one of the T-rex dinosaurs. These guys must know that the dinosaurs and knights never did fight right? Regardless, it is good to know that they are putting in the money to expand the dinosaurs and hopefully keep them around for many years. I know the kids sure love to see them. Written on April 25, 2008 by Rylan & Kaitlyn. Kaitlyn and I are pretty darn excited. 24 hours from now, we will be on the road to California and on Sunday/Monday we will be at Disneyland. I am really really looking forward to seeing some of my favorite characters again. Kaitlyn I think is going to be scared because she is very touchy. I'll protect her. Our Grandma got out of the hospital the other day. That sure was a crazy visit. She went in for a pretty basic surgery and then started having troubles. At one point they wouldn't allow visitors because they thought she had MRSA. They ran some tests though and it luckily came back that she did not have it. She is at home resting now so we went over there last night. I got to play with the cat that we gave her a few years ago. She is a nice kitty and lets me play with her and get kisses from her. Kaitlyn was pretty fascinated as well. Mom and Dad are working hard getting ready for a craft show next weekend. They have been plotting out their table designs and making sure they have plenty of bows to sell. The lady who purchased the first set of bows gets her order today. I have seen and reviewed the bows and I think they are top notch. I think that she will love them and they will sell super fast. Let's hope so. Now before I wrap up this week, let me tell you what Kaitlyn has been doing lately. She is now getting into trouble by removing her diaper secretly. Twice now she has done it while down for a nap. When my mom comes up stairs to check on her she has the whole crib covered in pee and last time she pooped. Talk about nasty. They need to get this under control because that is not going to work out. She thinks it's the funniest thing of course and she gives the biggest smiles after you notice her without the diaper on. Sisters, what can you do about them! We have packing to do so I am going to leave it at that. Well get some new pictures up when we return. Have a good weekend. Written on April 23, 2008 by Kevin. It wasn't more than a couple weeks ago that my wife's addiction to hair bows for Kaitlyn began. We bought a few handfuls of bows and never looked back really. It dawned on my wife a bit later that she could make these herself. After figuring out how to make basic bows, it was a dash to learn as many as possible. Dragonflies, butterflies and lady bugs oh my. When my wife realized that making these different types of bows were fairly easy we began talking about selling them. My wife is a big fan of craft shows and I grew up around them as my mother sold crafts from as early as I could remember. We could do this we thought. My wife has been quickly learning new bows and designs to make and they are turning out amazing. We now have a big enough selection that we are beginning to pitch the idea to others. We stopped by our local downtown district where they have boutique shops and the first owner we asked took my pitch. We made our first sale yesterday. It wasn't much but we are happy to see someone else appreciates the work behind them and is willing to pay for them. We are making plans now to attend a craft show in two weeks and set up a booth. We are in mad scramble mode trying to prepare enough bows. Some of them are quite time intensive. Welcome our new small business. The (currently withheld) name originates from what I used to say to make Kaitlyn smile and laugh. It was a random set of words that she just seemed to love. We are making this a full family business in which my wife designs bows, Rylan tests the bows (if he knows what it is, it passes), Kaitlyn models the bows and I photograph them. It has been very exciting around this place lately and I think it will continue with the craft show where we will be the only bow selling booth. Priced right, I think these things will be flying off the table. Written on April 22, 2008 by Kevin. My wife has been working hard lately on a new project but during the day this can be difficult with two kids. We have been meaning to get Rylan some crafts to make and she is using this time to give him a new fun thing to play with and get some work done at the same time. While Kaitlyn was down for a nap yesterday, my wife setup a bit of supplies on the table for Rylan to try out. 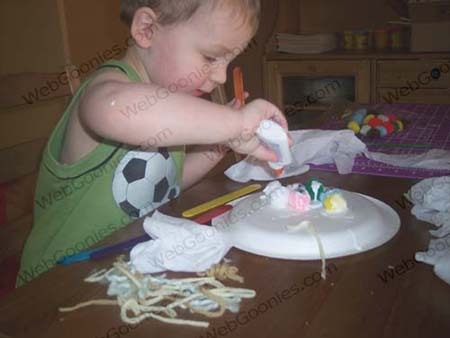 This was the first time he had used glue and he was just thrilled about it. This gave Rylan a good hour of play and just about equal time for my wife to work on her own project. I think this is going to be a pretty common thing now. I don't think Rylan will mind at all. *** A friendly Earth reminder because today is Earth Day. 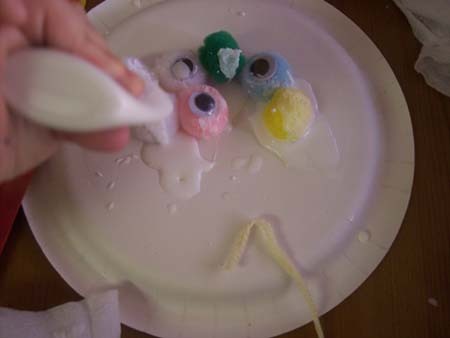 Don't forget to save things from around the house like toilet paper and paper towel rolls to be used later on crafts. There are hundreds of things that can be added into your kids craft supplies that will make their day and you get to do a bit of recycling at the same time. Written on April 18, 2008 by Rylan & Kaitlyn. Welcome to another week in review. The big news this week was that our grandma was in the hospital this week. We have gone to see her the past few days lately to help cheer her up. Kaitlyn and I both were a bit scared to give her hugs and kisses. My mom asked me why I was scared to see grandma and I told her it was because of her hair. Her hair was all crazy from being in bed and from coming out of surgery. My mom thought it was pretty funny. Kaitlyn seems to have stopped her quest to walk and has since decided to move towards talking. If you listen carefully, she has said mama and dada a few times. I know my dad is pretty happy because I didn't say dad for many many months after I said mama. Soon she will be picking up words as fast as I am. Speaking of Kaitlyn, that little rascal keeps trying to steal my breakfast cereal. The other day she stole my Kix and was eating them. Luckily she doesn't seem to be allergic to them which is great. I guess I don't mind sharing them with her as long as she doesn't take them all and of course she needs to stay away from my milk. Kaitlyn's 9 month doctor appointment went well. She is doing good it looks like except she is still a tiny little girl. My mom and dad are trying to beef her up but it's a slow process. Now that she is drinking formula though I think she may get bigger faster. She definitely seems happier now that she is drinking formula. I think it fills her tummy up more than milk from my mom. Our other Grandma and Grandpa headed off to Seattle for the summer. In fact, they will be gone for about 5 months this year. We are definitely bummed about it but luckily they are coming back for a few visits. I don't blame them for leaving though because it get's super hot here in Arizona and my dad says it's really nice in the summer time in Washington. They sure are lucky. We will be heading out of town soon as well when we head up to Disneyland again. I guess we are pretty darn lucky as well. Written on April 17, 2008 by Kevin. Bows are litterally taking over our house.. they are everywhere. More information to come when we have a bit more to give out.. for now, count this as a teaser. Written on April 16, 2008 by Kevin. One of the fun (sometimes most difficult) things about being a parent is finding new things to feed your kids. Sometimes you can come up with your own recipes like the time I made sweet potato pancakes. They basically turned out just like you would think and they turned normal pancakes into something a tad bit more beneficial. Other times, you need to consult the manual, aka the cookbook. A while back, my wife made Rylan a plate of Apple Nachos. 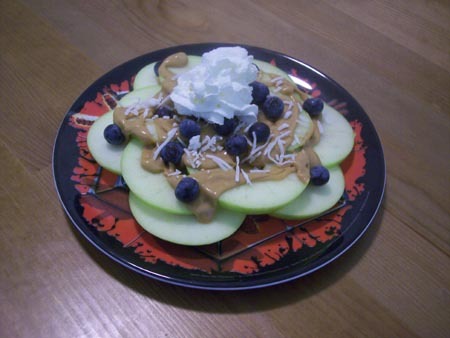 As pictured, they include a healthy serving of apples and blueberries topped with melted peanut butter and topped with a bit of whipped cream. Rylan gobbled it up with a huge smile on his face. Mark this one as a success. Written on April 15, 2008 by Kevin. We had a small party at our home on Sunday. A gathering of family to eat good food and to play the Nintendo Wii. It is also a great opportunity for Kaitlyn and Rylan to have some play time with their cousin Hayden that they do not get to see very often. They seemed to have a blast. Rylan crawled around with Hayden imitating the noises he was making and showing him how to get in trouble. Kaitlyn tried to tag along as well but she sometimes get clobbered by the older kids. We had told Rylan that we were going to have a party a few days before and when I reminded him on Saturday, I asked him who was coming. He very quickly said "Papa!" (grandpa). He then said "Hayden!". We hadn't reminded him that Hayden was going to be coming but he sure was excited for him to be. The party day came and when they opened the door, Rylan answered and started yelling "Hayden! Hayden!". He definitely has found a buddy. Now yesterday and today, Rylan just keeps asking for Hayden. We made a trip out to their place yesterday for them to play a bit more but making the drive everyday would certainly be an issue. I've heard of kids doing this but Rylan has never really found anyone to be such buds with. Now that Hayden is older and mobile, they are having a heck of a time together. When Kaitlyn hardens up a bit more she will be able to join in too. She is a very sensitive little girl though so it may be a bit longer. She certainly looks cute trying to participate though. Written on April 11, 2008 by Rylan & Kaitlyn. It has been a big week for Kaitlyn. She has now weened herself off feeding from our mom and now is eating only baby foods and having a few bottles of formula. She is doing really really well drinking it and does a great job holding up her bottle even though it is glass. I am very proud of her. I know my dad wrote a post about Fresh & Easy this week but I just want to say how much I like it as well. We are preparing for a party this weekend so we have been heading in there a lot this week. Each time, I get to sample a few goodies such as cookies, crackers and even juices. Yummy yum yum. I did get yelled at though because I got on top of one of the scales they use at the check outs. Mom wasn't very happy with me either. Our mom put us in our new bathing suits today and that was a blast. Kaitlyn has the cutest purple bikini ever. I have some wicked cool red Cars shorts. We can't wait until we can go to the pool at our grandma's house. I think my mom is going to try and sign us up for swimming lessons which will be pretty neat. We headed over to the park the other day while the temperatures are still bearable here. In fact it was a nice day with a bit of a breeze. Kaitlyn had a blast riding the swing while I ran around going down the slides. I like going Peter Pan style which is going face first. It's exciting! My dad showed me how to do pull ups on the bars. He's a macho guy. I tried to hold myself on the bars too but only lasted a few seconds. I sure looked cute doing it though. Oh, our cousin Jenna came into town the other day and we got a chance to hang out with her at Chuck E. Cheese. We went around playing all of the games and winning a bunch of tickets. We had a yummy pizza to go along with it. It was fun to see her again. I think that's it for now. We are still preparing for our party on Sunday. It's a Wii Party! I get to show off my new Wii playing skills to the whole family. We are going to have some super good food as well. We can't wait. Written on April 8, 2008 by Kevin. Anyone you ask will tell you that I am typically a pretty cheap frugal kind of guy. I tend to put a lot of thought into purchases which can drive my wife nuts. What I do however like to do is surprise my wife and kids with something unique that I find quite amazing. Welcome the dual cereal dispensers. Yes, the same idea that they have at hotels throughout the world, we can now dispense our cereals at the turn of a wheel. It can hold two boxes of cereal which is great for letting Rylan choose what he would like that day while getting a full view of it. I purchased this item during one of the JCPenny online sales. It had been atleast a year but just recently we cracked it open and began using it. We can now ask Rylan which cereal he would like in the morning and then he waits patiently at the table as we get it ready. The reason I bought this item was that I thought it would be fun for the kids to get their own cereals ready in the morning when they get old enough to do so. Sure they could probably learn to get it out of the bag but I think the dispenser should help with those big potential messes that a bag can sometimes do, plus it's just fun. The dispenser seems to do a good job at keeping the cereal fresh. The bottom is kept airtight (?) by using a flexible rubber wheel which also helps guide the cereal out. This does come at a price however as it can sometimes crush up the cereal. Despite the picture showing so, I might be a bit cautious about using flake cereals in this. We go through cereal fast enough that we have not noticed any problems with the cereal freshness so far. Overall, I am pretty pleased with my random purchase. I would recommend it to other families who want to let their kid have a choice which cereals to go with in the morning. Rylan sure seems to get a kick out it. Written on April 7, 2008 by Kevin. Months ago, I was driving down the road and as I came to the stop light, I noticed a new building was coming up. A place I had never heard of, Fresh & Easy. The name peaked my interested as our family has been trying to find healthy and quick meals. I figured with a name like that, we were going to find exactly what we were looking for but it didn't end there. I waited a few more weeks and when it was completed I went to check it out. First impression, this place is clean, quiet and calm. The hustle and bustle of your typical grocery store is not seen in my local Fresh & Easy stores. We are able to walk into the store and not have to fight to grab a box of cereal or bread. We are working on getting our entire family to eat a bit more healthy these days and this store really helps that out. A large portion of their store is their own house brand which does not have added trans fats, no artificial colors or flavors and many of it has no preservatives. They have many, small family, prepared meals ready to go at very affordable prices. The meals are tasty and work nicely for us right now with only the 3 of us eating meals. I would have thought as I opened the door that I would be paying top dollar for most of their food in the store but that really is not the case. Prices are fairly equal to if not less than our typical grocery store. Unique items are still priced reasonably enough that we can try them without breaking the bank. I think I join a group of others when I say that it is actually fun to shop at this store. Items that are best used by the current day are slashed at 50% off which is always great. Throw in the coupons that they hand out freely, you are looking at going home with a few great meals at a great price. For those living in Arizona, California or Nevada and who have not checked out their nearest Fresh and Easy store, run now. For those who do not live in those states, hope that someday you can find a grocery store as great as this one. Written on April 4, 2008 by Rylan & Kaitlyn. Friday is here so now Kaitlyn and I can sit back and relax for the weekend. Well I guess we do that all of the time so it's really no different. At least my mom and dad get a slight break. This weekend we are having my grandparents come over to help paint the house downstairs. My mom and dad just about finished up our room painting and it sure looks neat. We don't want to ruin the surprise so we aren't going to mention anymore of it for now. We will get to hang out with grandma while my dad and grandpa are downstairs painting the walls and inhaling the nasty smelling paint. Yuck. Kaitlyn has decided to wean herself from feeding from my mom. She did as good of a job as I did when I was little like her. She is doing super good eating her baby food now but we are running into more things that she is allergic to it seems. As for me, I am learning to jump. I want to be able to fly like Peter Pan so jumping is the first step to that. I am finally able to get a tiny bit off the ground but it sure gives me a boost of confidence and excitement. I am going to impress my grandma and grandpa with my new skill when they come by. Speaking of new things, my grandma and mom helped me learn how to play Mario Party on the Wii. I know a couple of the buttons to push and how to shake it real good. I still have a bit of learning to do before I can bowl a few frames or hit a hole in one on golf. I need to practice because next weekend we are having the family over to play Wii. I think that is going to wrap it up. Have a good weekend. Written on April 2, 2008 by Kevin. I think all mothers look forward to when they can put bows in their daughter's hair. It seems to be one of those deep desires that all women have. My wife definitely has this desire in her and she finally is able to satisfy it. Kaitlyn's hair, like most babies, started out with next to nothing. The cradle cap and eczema seemed to slow the hair growing process even more. When we got that under control, the hair started to flow out. Now when you look at her she is starting to have layers of soft hair that is prime for bow placement. We recently headed to a new store to sell some old baby clothing and my wife found her new obsession. Bows that actually work in babies thin and silky hair. Kaitlyn got to model her new bows for the first time at Easter. They seemed to be a big hit. There is no question now that she is a girl. She certainly looks cute in them. I originally did not care for them but they have certainly grown on me and as her hair grows even longer, they just look more cute. They stay quite well in her soft hair and she doesn't bother with them much at all. The best part is that both my wife and Kaitlyn get big smiles when the bows are put on.